As Sneak Like A Ninja Day creeps closer and closer it’s easy to feel overwhelmed; am I prepared? Am I ready? The good news? There is still time. But December the fifth is coming. Act now. Think ahead. Don’t let Sneak Like A Ninja Day take you by surprise. Preparedness is key. Take a moment to consider the party feast. Dig out some delivery menus for sushi (for the Ninjas) and pizza (for the Ninja Turtles), stick them to the fridge with magnets. Now you’re ready. Feels better, no? And that’s where this cocktail comes in. In previous years I have been a slave to the notion of a lychee martini. The first year I made them the sweet syrup from the canned lychees seemed to sneakily trick people into thinking that they were not drinking pure vodka. A guest actually ended up in the wrong city having passed out on the train ride home. 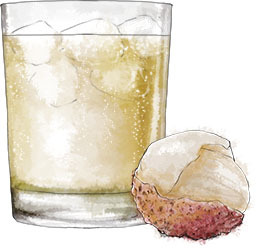 Now, many test runs later, I have a lychee martini recipe that will do the business and not actually endanger people, and I recommend it. But to ring the changes I am turning to tequila for this year’s party. This entry was posted in The Wednesday Tipple and tagged ginger ale, lychee, ninja, sneak like a ninja, tequila. Bookmark the permalink.